Finish in Picture: Satin interior with rustic textured exterior. 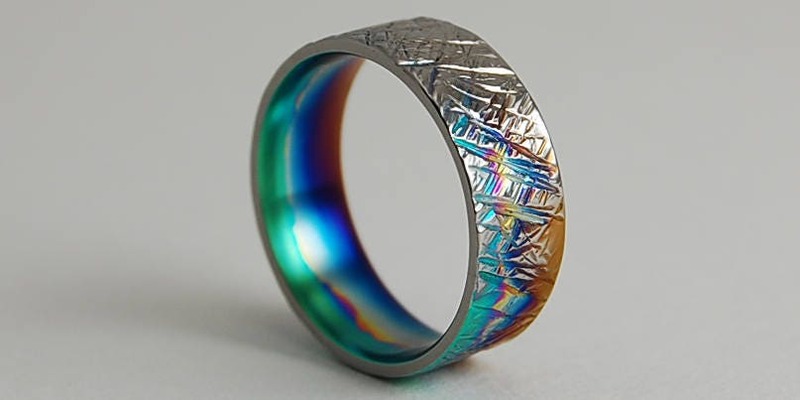 This ring is beautiful. It is exactly what I was looking for. The craftsmanship is amazing. The anodizing is incredible. Romas Banaitis was great to deal with. There was open communication throughout the process. The order was shipped exactly when they said it would be. I would definitely buy from them again. My husband is very happy with it. It was his 35th anniversary gift. We love this ring! It's even better than in the picture. More rainbow streaks on the outside than expected, and it looks great! Almost like the inside of an abalone shell. My husband is super happy with his wedding band, and Romas was very easy to work with.